Fox supplies four different types of Blowers for Dilute Phase Pneumatic Conveying with Fox Venturi Eductors… since 1963. Let Fox select the best blower for your application. Fox supplies hundreds of blowers each year as part of Fox eductor systems, ranging from small regenerative blowers to 200 HP blower packages. Only Fox Valve has over 50 years of experience in integrating blowers with venturi eductors in thousands of successful industrial processes. No other company comes close to our experience and expertise in integrating blowers and eductors for specific conveying applications. Standard Fox Regenerative blowers can usually ship in 2 – 4 days. Since standard Fox eductors in 1” – 6” sizes are stocked in carbon steel, stainless, and ceramic-lined versions, we can ship a conveying system in less than one week. Standard pd blower packages ship in 2 – 6 weeks. Selecting the right conveying velocity is a major technical consideration in making a conveying system work reliably. This is particularly critical when conveying fragile products, like breakfast cereal or pet food, and abrasives, like silica, cement, or glass-filled pellets. An engineered eductor/blower combination from Fox assures proper selection and operation. 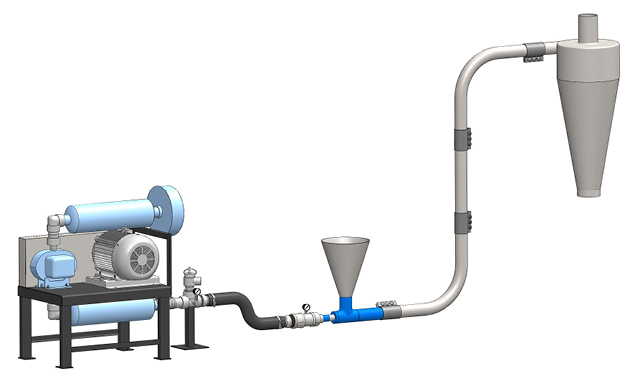 When you procure the blower to drive your pneumatic transport system from Fox, you are assured of complete, prompt technical support from our staff of pneumatic conveying experts. Fast Delivery: Standard blowers from 1 – 40 HP, are usually available for shipment in 1 week. 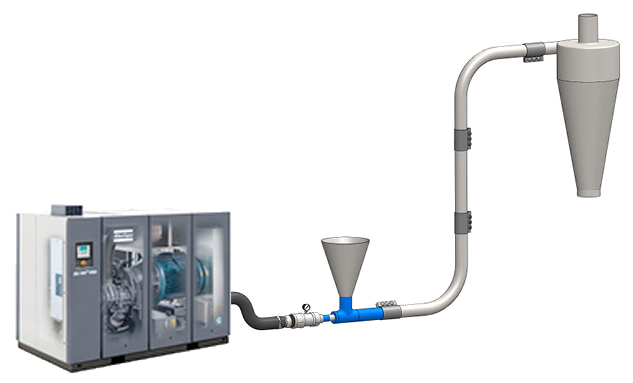 Quiet: Regenerative blowers do not need to be hidden away in compressor rooms or on rooftops. When properly installed, they meet OSHA requirements. Inexpensive optional silencers can further reduce relatively low noise levels. Compact: Because they are closer in size to basketballs than Buicks, regenerative blowers, unlike pd blower packages, can fit snugly beneath equipment like screeners, extruders, and bulk bag unloaders. They can also be installed on partable carts. Motors: Standard blowers can accommodate a broad range of US and international voltages at 50 or 60 Hz and are all suited to VFD operation. Blowers are readily available to meet requirements such as explosion proof (XP), Mill & Chemical Duty, Premium Efﬁciency, and Washdown. Modest Capital Costs: Regenerative blowers are usually significantly less expensive than positive-displacement blowers. 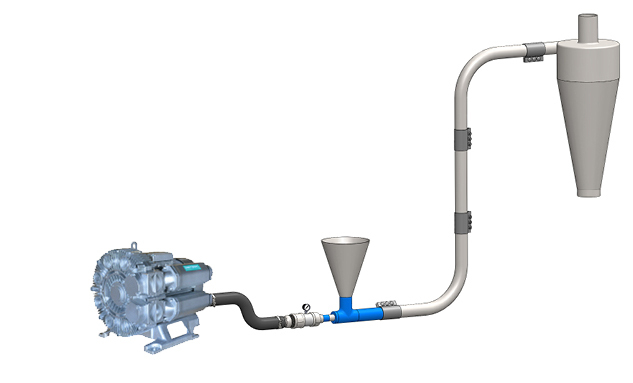 Versatile: Standard positive-displacement (PD, lobe-type) blower packages include the usual appropriate accessories. In addition, Fox can supply customized packages that include everything from special motors to acoustic enclosures, starters, VFD’s, instrumentation, etc. Delivery: Standard delivery for most packages is 4 – 6 weeks; however rush deliveries can occasionally be made in about 2 weeks. Reliable: When properly maintained, pd blowers are very reliable. Quiet: These blower packages typically come pre-installed inside factory-designed and built acoustic enclosures. Very quiet operation is the result. Versatile: Standard options include VFD operation and advanced diagnostics and controls. Delivery: Standard delivery for most packages is 6+ weeks; however, rush deliveries can occasionally be possible. Reliable: When properly maintained, rotary blowers are very reliable. Economical and Efficient: Centrifugal blowers are a good solution for larger (6” to 12” diameter) systems, especially in cases where convey rates requirements are lower, and distances are limited. Versatile: Centrifugal blowers are especially well suited to applications where air needs to be supplied to varying numbers of eductors simultaneously. Delivery: Standard delivery for most packages is 3 to 5 weeks; however, rush deliveries can occasionally be made in about 2 weeks. Reliable: Centrifugal blowers require virtually no maintenance and are very reliable. Blower is fundamentally unsuited to the application, due to insufficient pressure and/or flow rate. Reliability of the blower cannot be predicted due to uncertain condition. A blower that has been stored for any period of time, without having been properly protected from the environment probably has internal corrosion and possibly worn bearings and deteriorated seals. The clearance between rotary lobes is often about the same as the thickness of a sheet of paper. It takes very little corrosion to seize up a blower. Blower package has a motor and drive which is smaller than required. Renovating an old package, with a larger motor and drive is often not far off the price of a brand new package – with a brand new warranty. No warranty. Do you really want to trust the reliability of your new system to an old blower from the bone yard?